Spent some considerable time last night on the "special" portrait, and i am quite pleased with the results... I will let it dry for a few days and then put the finishing touches on it. 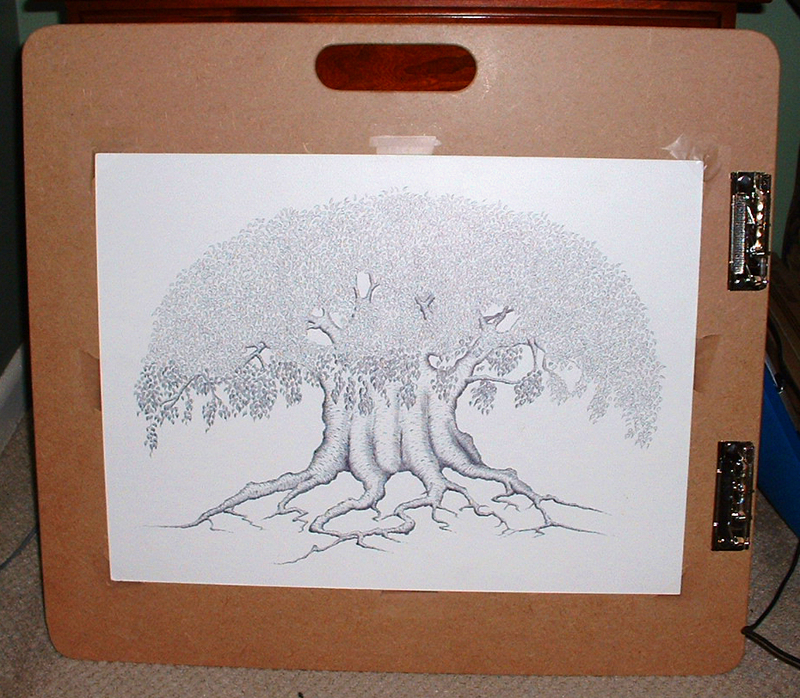 I have also added a new section to the website to accomidate my latest two drawings, under symbolic, i finished the bonsai logo... I start the dives series next and a scene from Italy in oil for the wonderful wife! I did ALOT this weekend, I was like a man possessed. I put some new pictures on the site, mostly in the misc. page. Finally went through the drawing cabinet and threw out the crap and then scanned or photographed some old work. I also started painting the special portrait, and i am pretty pleased with how it is turning out. I also did some research on my first dive series drawing and found some neat stuff, and then bought the smoot bristol board i am going to use for these drawings... what else? OH! I found an old drawing i never finished, so it is on the board to be completed. It will be my symbol for my bonsai garden. Might finish it today and work on the portrait some more as well... feeling good. I made a few changes on the website. I added a student art page of which I am very excited about. I already have a piece up, go check it out! I also added a photograph and touched up a few pieces that needed touching up in photo shop, and deleted a few things, but... who cares?!? The real reason i am writing tonight is to tell you to go to the artist page, i added some really neat new artists to the list... especially Donato Gianocola. WOW, he's amazing. See for yourself, go on, do it! I did it, i drew something! I finished it tonight. One of my students gave me the idea for his band logo. It's pretty wacky, just a black and white, but i like it. I will photograph it, photoshop it and have it on the site tomorrow night... 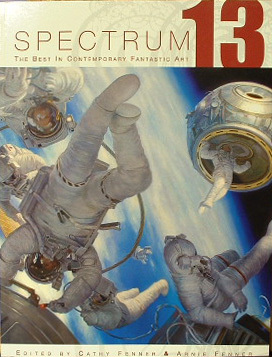 I also bought my first copy of SPECTRUM and if you haven't seen it, then you haven't seen anything yet. It is the premier science fiction/fantasy rag. 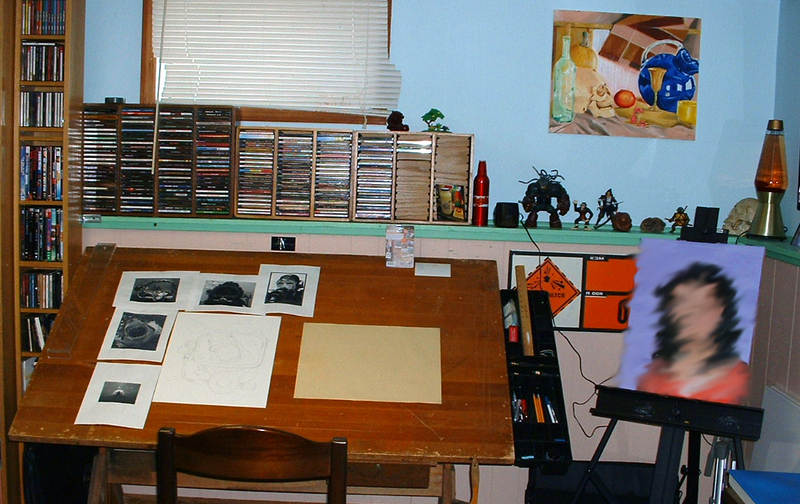 It has a collection of all of the best that was produced in the past year in the way of paintings, drawings and sculptures in the fantastic realm, simply amazing, it has inspired me to paint, paint!!! I learned a very sad truth yesterday from an old friend of mine, Jerry Jancuk, that our old martial arts instructor died. His name was Rix and he trained with Ed Paker, who, taught Elvis. He was a master of the Kenpo Karate system. I trained under him and liked him very much. I mention him because he is featured in my "early years" comic from self defense class. (I spelled his name wrong, but hey, i was a kid) He was a good man that did alot of people good and the community, he cared and wanted people to be able to defend themselves, if they ever needed to and for that, i will be eternally grateful to him. He will be greatly missed by alot people. Rest in Peace, Master Rix, you have earned it. Got DSL today!!!! Now working on this site will be so much easier. I will be doing the "secret" oil portrait this Saturday, i have painted the background, now for the "flesh" tones of the neck and face, keep your fingers crossed for me, ok??? See ya soon!